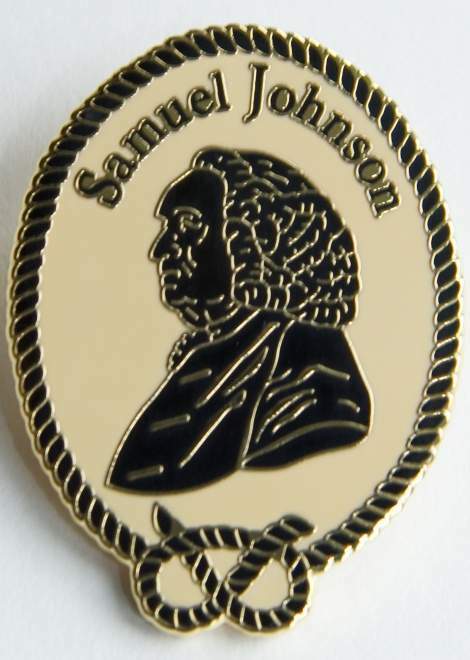 Samuel Johnson was born in Lichfield, Staffordshire on 18th September 1709 to , Michael Johnson and Sarah Ford. His father was a bookseller, and Johnson owed much of his education to the fact that he grew up in a bookshop. Johnson was plagued by illness all his life. As a child he suffered from scrofula, smallpox, and partial deafness and blindness. As an adult Johnson had a tall and robust figure, but his odd gestures and tics were confusing to some on their first encounter with him. 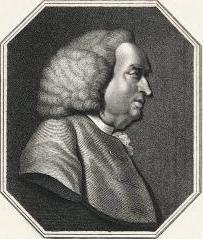 Boswell's Life, along with other biographies, documented Johnson's behaviour and mannerisms in such detail that they have informed the posthumous diagnosis of possible Tourette's syndrome a condition unknown in the 18th century. He attended Lichfield Grammar School , where he learned Latin and Greek. In 1728 and 1729 Johnson spent fourteen months at Pembroke College, Oxford. Too poor and embarrassed by his poverty, Johnson could not complete the work for a degree. Johnson supported himself with teaching jobs after his father died in 1731. In 1735 he married Elizabeth Porter (“Tettie”), a widow some twenty years older than him. Still trying to find a way to make a living, Johnson opened a boarding school, which had only three pupils. One of them was David Garrick (1717–1779), who would eventually become a famous actor. On moving to London in 1737, he began to write essays for The Gentleman's Magazine and wrote Tory comments on the proceedings of Parliament. After nine years of work, Johnson's Dictionary of the English Language was published in 1755; it had a far-reaching impact on Modern English and has been described as "one of the greatest single achievements of scholarship". His later works included essays, an influential annotated edition of William Shakespeare's plays, and the widely read novel Rasselas. In 1763, he made a lasting friendship with James Boswell, with whom he later travelled to Scotland; Johnson described their travels in A Journey to the Western Islands of Scotland. Towards the end of his life, he produced the massive and influential Lives of the Most Eminent English Poets, a collection of biographies and evaluations of 17th and 18th century poets. By sheer ability Johnson rose gradually but surely to be a recognized giant in a literary world that included such writers as Fox, Gibbon, Burke, and Goldsmith. His services as a political writer, and not as a man of letters, secured him finally a government pension of £300 a year, after which he was more comfortable financially. Mrs. Johnson died in 1752. Johnson lived for many years in bachelor quarters, but with a room ready for him whenever he chose to occupy it at the home of a Mr. Thrale, a wealthy brewer. In this home he spent much of his time for many years. After Mr. Thrale's death his widow made a hasty second marriage, which gave Johnson offence, and this home was closed to him. He had at this time a house in Fleet Street. Here he maintained for years several friends who quarrelled outrageously with each other and made their benefactor miserable. Johnson, however, endured it with patience because he pitied them. However quick he may have been to resent an injury or insult from a superior, he was unfailingly kind to inferiors and generous to the poor. Johnson was for many years the centre of a literary club, by whom he was regarded with great affection. In 1784 he died peacefully at his lodgings alone, in so far as he was without relatives but affectionate friends attended him. He was buried fittingly in Westminster Abbey. Badge Type: High quality hard enamel with brooch pin fastener. Size: 38 mm tall by 28 mm. Colour: Black, gold and cream. Obverse: Portrait of Samuel Johnson facing left with legend above "Samuel Johnson"
Reverse: Engraved reverse legend in three lines reads; "England's Greatest Man / of Letters / 1709 - 1784" plus a unique stamped issue number out of a stated total issue of 200 making each badge unique. Badge makers marks in exergue. Only 200 of each badge type are to be made. Availability: 110 - After launch date in mid April 2009. Price: See table below for details. Make all orders payable to Linda Smith and send payment to 2, Mill Terrace, Thorpe Thewles, TS21 3JS, United Kingdom.